There just aren't enough words to describe how enjoyable relaxing weekends are. This weekend, other than my trip up to Roswell, I have spent the entirety of my time in and around Buckhead, with no major plans. These types of weekends, especially when sandwiched in between busy holidays and other weekends to come, are such a blessing in disguise. If we can restrain the desire to fill up the free time with activities, what results are hours and hours of quiet recharging. After a quiet night like that spent at home on a Saturday, the other benefit of weekends like this is that I wake up ready to go early the next morning. Today, we got in a run at Chastain before picking up supplies to make a healthy brunch. While I love going out to eat on the weekends, heading out in workout clothes is not my idea of Buckhead Betty living. Instead, we grabbed supplies and I recreated a family favorite from local brunch spot J. Christopher's - Huevos Avocados. 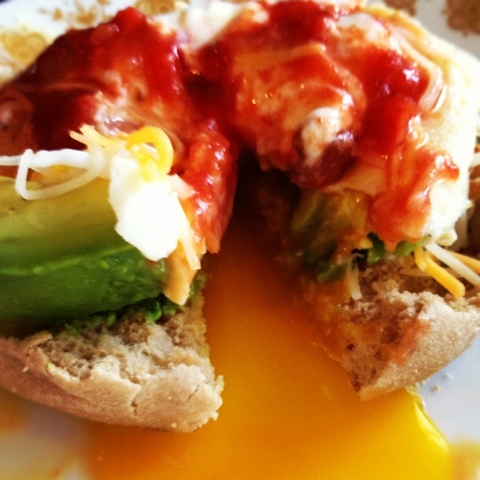 With hearty high-fiber English muffins as the base, and some Mexican cheese, salsa and sour cream to top it off, this over-easy egg + avocado dish makes me so happy. It fills you up without being heavy, and it's full of healthy fats. Here's my "recipe" - if you could even call it that! I hope you enjoy it! 2. Cut avocado in half and use a knife to slice, arrange one half of slices on one English muffin, the other half for the second person's. 3. Crack two eggs into your greased pan and make over-easy eggs. 4. 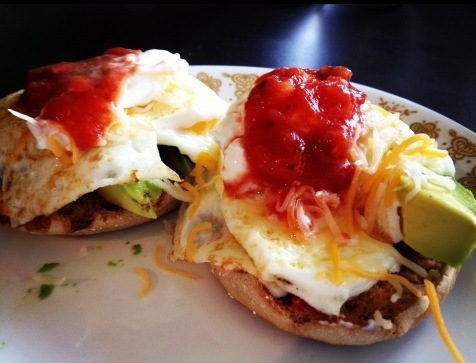 Arrange first two finished eggs onto the halves of the first English muffin and avocado. 5. Top eggs with shredded Mexican cheese, a spoonful of low-fat sour cream and a spoonful of salsa. 6. Repeat with two more eggs for the second serving.